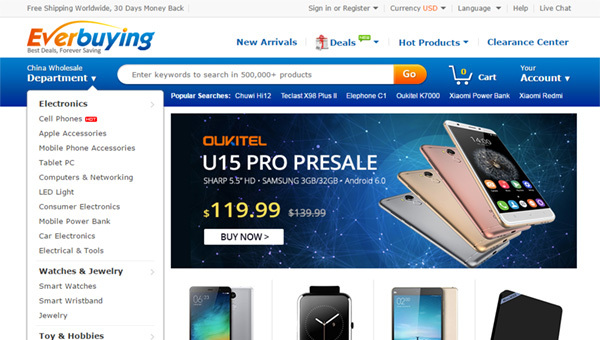 Everbuying - is a Chinese shop that has been selling various electronics and household items since 2007. More than 250,000 products are available on the website. The website has a $0.99 section, where you can buy some trifle for one US dollar. These pages are mostly used to test the shop service and quality of products. Everbuying is at a very high level there. The shop suggests daily sales where you can buy products at great discount prices. Everbuying suggests the system of accumulation of bonuses, which is called EB points. 50EB points are equal to $1. These points can be used to pay for goods when shopping. These points can be earned in many ways, for instance you get 100EB for online registration, for confirmation of email - 10EB, 10EB - for downloading the user picture, and from 10EB to 50EB for a purchase review. You also get 1EB for every dollar spent when shopping. Please note that there is a restriction when paying for purchase with EB points - the amount of discount should not exceed 30% of the purchase price. Shipping is free worldwide, and is carried out by Chinese mail. Express delivery services are also available: UPS, DHL and EMS. Shipping cost depends on the weight of order and destination country. Payment is made via PayPal, Western Union and bank transfer. I bought an item from Everbuying and was charged $AU40 for shipping. The site says FREE SHIPPING WORLDWIDE but it's NOT true. I buy many different Items on Everbuying for two years now and I can say that Everbuying normally delivered in time, sometimes very early. I haven't had any fakes from banggood yet (Eg. Xiaomi Items) and banggood often has very low prices. The customer service works well and they answer to your questions within 2 business days. So what I just can say: Everbuying is a serious Chinese seller, recommend!